Of course, you can always edit a dozen on two descriptions manually. But if your channels has hundreds or thousands of videos, you would really like some batch convert option. Well, lets find one. The first thing you need is the FoxReplace plugin for the Firefox browser. Install it, enter the plugin options and configure replace rules. In this example, we will be changing the old domain names to new ones in all links in the description boxes. Unfortunately, the plugin doesn’t work with Youtube main site correctly, so enter the mobile version URL. Now enter what do you need to change and what do want to change it with. Don’t forget to check the automatic replace option. Open Your videos list on Youtube mobile site. To do that, just change the www. to m. in the browser address bar. Click Edit next to a video, and making sure that the text was replaced correctly, save the description. the next step may take. This step is for channels with hundreds and thousands of videos, where manual imput is out of the question. So we have to somehow automate the clicking. Two main utilities exist for that – iMacros for Firefox and Autoit. You have to use both in mouse coordinates clicking mode, and then loop the resulting script. Let’s get a closer look on Autoit. Download the software and run the mouse capture utility. Make sure that FoxReplace is in Automatic mode. button on the first page of the list in the script later on. Save the script. Go to the second page, as we already done the first one while recording the script. Now run the script and enjoy it doing your job. Well, in theory. 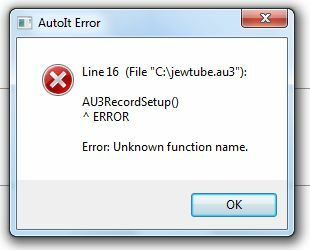 In practice, the software is not exactly bug free, and the compilator will probably pop out some errors. Clean everything from the script except the mouse coordinates. Then insert delays between each command and even a large pause in the beginning, so you have enough time to close everything before the script execution starts. If you didn’t move the browser window with the video list and managed to position your mouse in the exact same spot as at the beginning of script recording, it will probably work out. All this precision checking could really take a lot of time. So, as already advised, if you have less than 2 hundred videos, you’d probably do it faster by just using FoxReplace without automation. If you still don’t want to click manually and Autiot doesn’t work for you, consider using iMacros. It is probably simpler than Autoit, and far more stable piece of software.